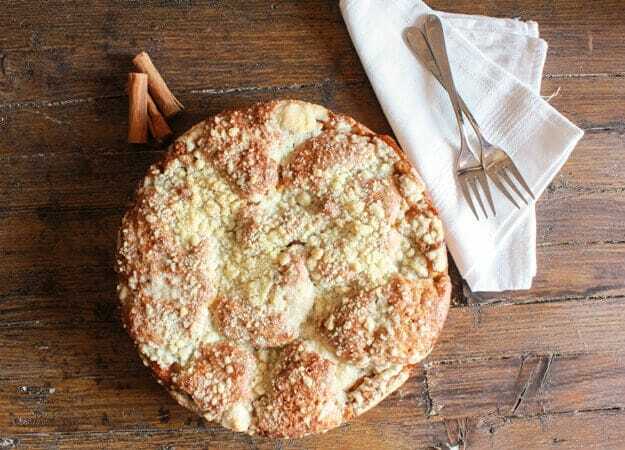 Apple Pie Streusel Cake, a delicious Fall Dessert filled with a Cinnamon and Apple filling and an amazing Crumb Topping. The perfect Breakfast, Snack or Dessert Cake. I was making so many delicious desserts with all those apples that my husband and youngest daughter picked a week or so ago. 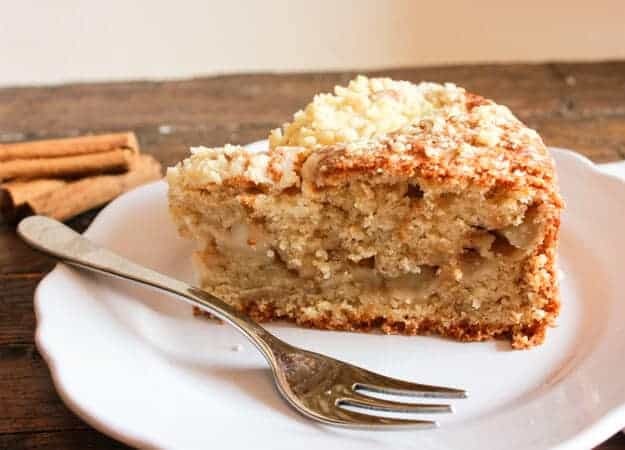 Ok I did make this Apple Pie Streusel Cake and those yummy Apple Pie Breakfast Turnovers twice each, but it felt as if there was no end to those apples. Unfortunately or fortunately, depending how you look at it, they came to an end. 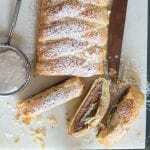 Although, I do have to say I really got into making this homemade apple pie filling. I have never seen apple pie filling in a can in Italy, ever. Once I saw pumpkin pie filling, which totally surprised me. And yes of course I bought it! As I have declared before the Italian and I don’t see eye to eye on cake. I love it chocolate and all that buttery creamy frosting, him no, not a bit. He even has the nerve to remove any and all frosting with a knife. And muttering under his breath “troppo dolce”, too sweet. So to make him happy I baked up this amazing Apple Pie Streusel Cake, as far as I’m concerned a crumb topping is a really close second to frosting. One of the best scents has to be apples and cinnamon baking in the oven. And this cake has both. It is really easy and fast, the lousy part is peeling the apples, but it will all be worth it in the end. The batter is almost like a muffin batter which means you just stir until moistened, in other words I count to 12 or 13 and then I stop stirring. If I don’t I will never stop. Enjoy! 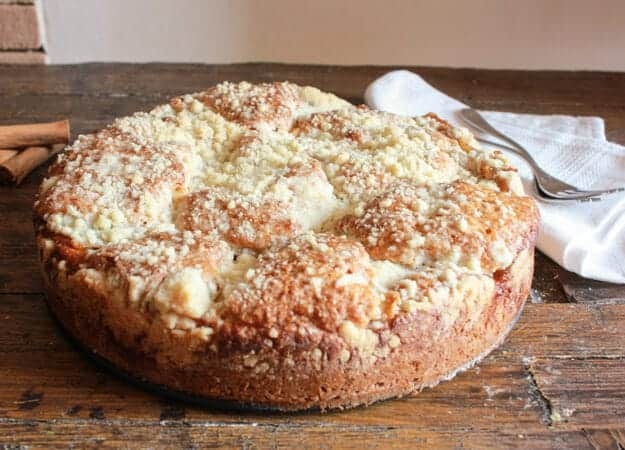 Apple Pie Streusel Cake, an easy and delicious cake, let the wonderful scent of cinnamon and apple fill your home, the cake is even better! 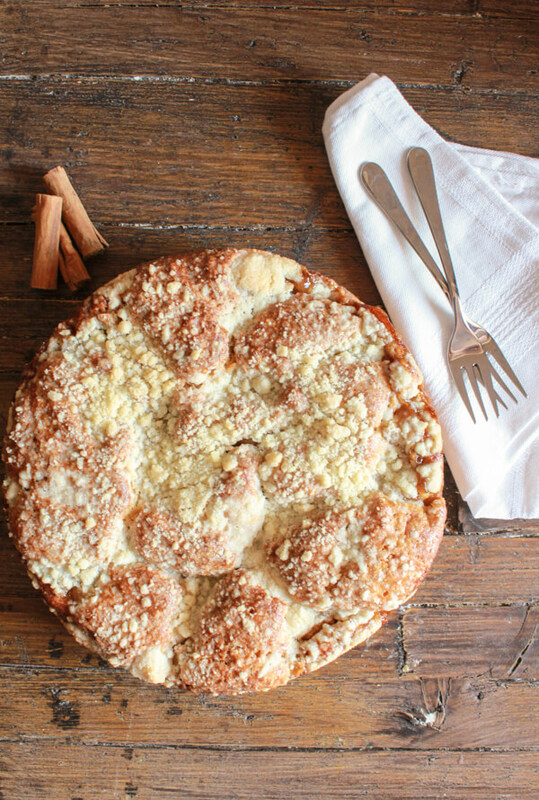 Apple Pie becomes a Cake! 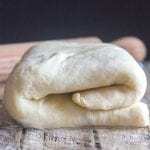 Pre-heat oven to 350° (180° celsius), lightly oil and flour a 9 inch (22-23 centimeters). Best to make pie filling first and while it is cooling prepare cake batter. 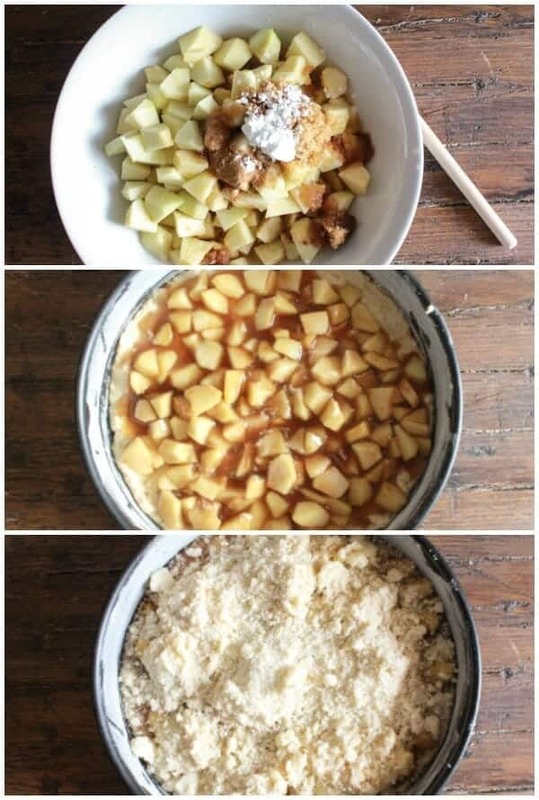 In a medium pot add chopped apples, cinnamon, brown sugar, corn starch and water, stir to combine, cook on low until thickened, approximately 10-15 minutes, stirring often. Once thickened, remove from heat and let cool. In a large bowl whisk together flour and sugar, add butter and with a pastry blender mix until mixture becomes crumbly, set aside 1/2 cup. To the rest of the mixture (in the large bow) add baking soda, baking powder and cinnamon. Add egg, yogurt and water stir just until moistened (stir approximately 12 or 13 times). Spread 2/3 of the batter on the bottom of prepared cake pan, spoon apple pie filling over batter. Drop spoonfuls of remaining batter on top of filling, sprinkle with reserved crumb mixture. Bake for approximately 50-55 minutes. Let cool. Enjoy! Loved It! Perfect for some coffee talk!! Everyone loved it! Hi Susan, thanks so much so glad everyone loved it. Happy Easter. I have just found your website, and all of your mother’s fantastic recipes. I pinned about twenty, and will try something soon. They all look beautiful, and enjoyedyo srories. Thank you! Hi Kareesue thanks so much, I hope you enjoy them. The cake looks delicious! One question: I made some apple pie filling then canned it myself. I’d like to use it in the recipe. Can you tell me how many cups of filling I would use? Hi Pam I would use about 1 1/2 – 2 cups as much as you need to make a single layer to make a filling in the middle of the cake. Hope that helps. Let me know. Cake looks wonderful, one question, did you use springform pan or regular 9 inch cake oan? Hi Lina, Thanks, I did use a springform pan but you could always use a regular cake pan, just grease and flour it. Hope that helps. 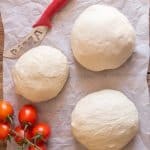 I so love all of your recipes, you may not be an Italian but you sure know how to cook my dear, such wonderful recipes you share and many are indeed very Italian, my Mother was Italian but my Father was German , Irish. Thank you so much for the lovely recipes, hugs and blessing to you and i think you are a DOLL . Thanks Mary Frances, my mother was actually Italian (a good cook in her own right) also (her father was born here) but my father had Irish blood, but thanks to my mother-in-law I really learned to cook Italian. Have a great weekend. i MADE THIS CAKE TODAY BUT HAVE SOME QUESTIONS DO YOU MELT THE BUTTER OR USE IT COLD AND DO YOU USE ALL THE APPLE LIQUID AFTER THERE COOKED? I’d love a piece of this cake right now! I wish I lived next door to you. This cake is a keeper. Thank you. I bet this is fantastic. 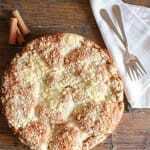 Reminds me of the Irish Apple Cake – lovely blog! Everything you bake looks so delicious! 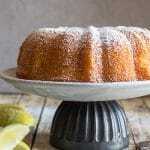 I’d love this cake with a hot cup of fresh brewed coffee! Sono d’accordo con tuo marito! But I sure do love streusel. I love the crunch and the cinnamon. Great job and I love your photos.